…government consultations, citizens’ juries and e-democracy are very often delivered by external contractors… The problem is when you outsource democratic services, online or face-to-face, you tend to outsource the culture change upon which their effectiveness lies… As any politician knows, democracy involves government officials or representatives spending time listening and interacting with citizens, outsource that and what’s left of our democracy? For e-democracy to work more than anything else, yes even more than money, we need an injection of staff time. Staff time to experience working in new ways. Staff time to listen, engage and understand all citizens, and time for staff themselves to become properly supported and empowered. Then, and only then, can they start to empower others. In my view, these conclusions don’t only to e-democracy – they apply equally to planning and land-use, the area that I work in. It’s been normal for many years for the public sector to outsource preparation of masterplans, town centre strategies and neighbourhood regeneration frameworks to consultants – I’ve been involved with some myself, for example in Keswick, Stromness, Dawlish and Turriff. There are of course good practical reasons for this, not least that it is often more cost-efficient to bring in specialist skills and experience for individual projects rather than retain permanent employees. It’s also quite normal for those consultancy teams to engage with local communities as part of those commissions. Again, nothing wrong with that – community engagement should be an integral component. What’s critical, however, is how the client gets involved in that community engagement. 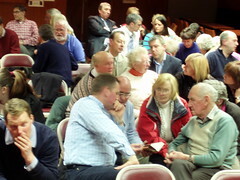 From the point of view of the local community, participating in an individual project is just part of a much longer process of building trust with those in power – as emphasised to me by community representatives at a recent workshop with Planning Aid for Scotland in Ardrossan. 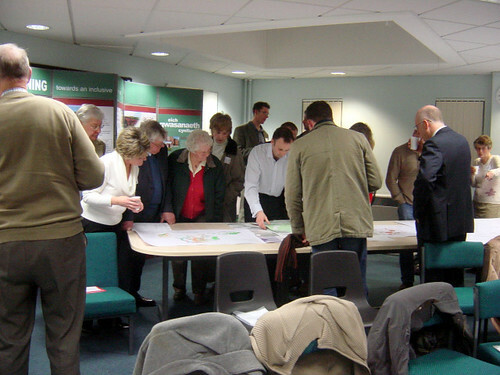 It’s critical that local authorities and government understand that they need to be sensitively involved in consultation, alongside their consultants, in order to help build this trust – an ongoing process which takes years, well beyond the time horizons of the average planning or regeneration project. The key message is that government should not regard outsourcing consultation as an abrogation of their responsibility to be involved in that consultation. The involvement of civil servants and local government officers alongside consultants is absolutely fundamental to the process of building trust with local communities. And, as Richard Wilson has written in a subsequent article, the need for this is greater than ever – he cites a drop in the percentage of people who believe they can influence decisions at either a local or national level since 2001. There is, of course, a responsibility on the consultant to guide their client on how they should be involved in individual community engagement exercises with a view to this bigger picture. No consultation strategy for any project should be designed in isolation: each and every project will have different requirements. A good consultant will spend time recent consultations and understanding the client’s relationships with local communities. Clients should be wise to this when they commission consultants. To return to the argument put forward by Richard Wilson and Alice Casey earlier, community engagement must involve central and local government employees themselves listening and engaging with the public, rather than outsourcing this. There are plenty of good examples of this around (such as Clydebank re-built’s record of public engagement and Fife Council’s recent consultations on Local Plans). …the majority of local government officers are working in more traditional, risk-averse, institutional environments and therefore face a considerable number of cultural and personal barriers to embracing e-democracy. Having been there myself, I know exactly what they mean. That’s not a criticism of any of my former colleagues: it’s a systemic issue that derives from the models of government and bureacracy that we have developed in the contemporary Western world. To consolidate this culture change, engagement and empowerment must start at home – within government staff structures, as Wilson and Casey imply. This suggests looking at how civil servants and local government officers manage their standard hierarchical organisational staff structures, which have historically developed for decision-making and accountability rather than for engagement and empowerment. More thinking is needed on how to accommodate these two sets of imperatives – there are no easy answers. As recession bites and pressure for staff cuts increases (such as in Bournemouth, Dagenham and Leicester), we need to think carefully about how to cut costs without compromising the objective of greater community engagement. I believe this is the holy grail of the attempts to make government more efficient on local government since the 1980s: cutting budgets is one thing, but changing systemic culture – especially when it involves transferring power within organisations – is a tougher nut to crack.